Louise Collier’s tropical island images reflect an enviable lifestyle. Louise Collier’s tropical island images reflect an absorption with her idyllic lifestyle on Low Isles near Port Douglas in North Queensland. 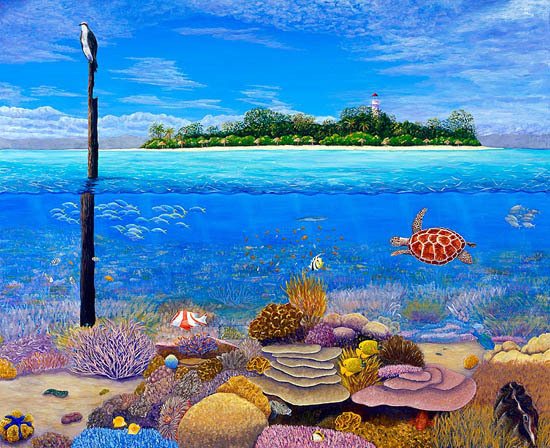 Using mostly oil paints on canvas, she captures the magic of the ever changing colours of the coral lagoon which is her front garden, the creamy coarse sand made from shells crushed by the tides, the wind-swept vegetation clinging to this low-lying coral cay and the vibrant life beneath the surface of the warm waters. Originally from England, Louise came to Australia as a teenager and settled in Perth with her family. Always interested in drawing and painting, it was only when she moved to live in the Kimberley area of North Western Australia that her latent ability and interest in painting blossomed. Responding to the rich colours of the rugged landscape and her new and adventurous lifestyle, Louise began to paint the gorges, rivers and lakes of her new home, near Kununurra, with skill and fervour. Then Life took an unexpected turn. With her new partner, Steve, Louise moved to live on the tiny tropical island of Low Isles near Port Douglas in Far North Queensland. 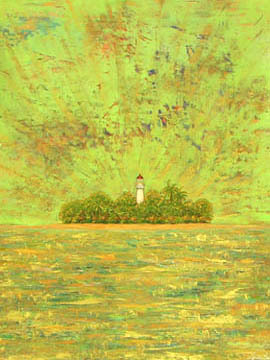 Its beauty was overwhelming and once she had set up her studio in their house overlooking the bay, Louise painted her tropical island images whenever she could. Clad in her tropical island clothing of brightly coloured bikini swimsuit – with sometimes a silk sarong knotted around her waist, Louise would go for a swim, send off the weather report, finish her household duties then pick up a paintbrush. Before she knew it, the day had passed, sightseers had departed and it was time for ‘sundowners’ on the beach before a relaxing dinner. Daring and adventurous, Louise thought little of setting out in their small ‘tinny’ to dash into ‘town’ for supplies or to take her children to catch the bus to school in Cairns, sixty kilometers south. 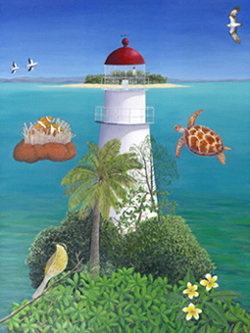 In 2007 Louise exhibited in a group exhibition, ‘Low Isles - a fragile sanctuary’ , which toured to Cairns Regional Gallery in 2008 and then was instrumental in setting up and helping to direct the inaugural Go Troppo Arts Festival in October of that year. 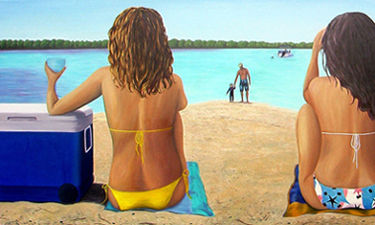 The artistic community and her many ‘boatie’ friends missed Louise and Steve greatly when, after five years, they decided to go back to the Kimberleys, where Louise once again exhibited paintings of that rugged area. PS: In 2015 Louise and her partner, Steve, were happily living in Perth but island life was never far from their thoughts. In October of that year they were married on one of the beautiful Whitsunday Islands on the Great Barrier Reef, an area that they also call 'home'. Such a romantic occasion in an idyllic setting - the whole of the island resort being dedicated to them and their guests - and one that I shall always remember with joy.